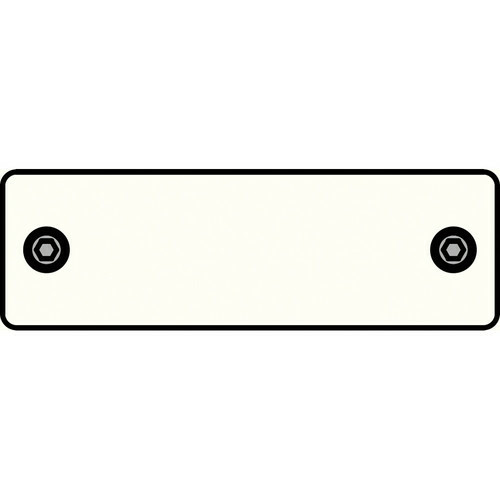 The IPS-B000S-WHT IPS Blank Insert (White) from FSR is a blank insert designed for use with IPS Wall Plate Opening or Under Table Mount. This blank panel can be used to cover one space in an IPS Opening or Table Mount. Use this unit to improve the aesthetic look of your installation and prevent dust and other foreign debris from entering through an opening. This blank panel can be used to cover a single space in an IPS Opening or Table Mount to improve the aesthetic look of your installation and prevent dust and other foreign debris from entering through an opening. Box Dimensions (LxWxH) 5.0 x 3.1 x 0.5"
IPS-B000S-WHT IPS Blank Insert (White) is rated 5.0 out of 5 by 1. Rated 5 out of 5 by GeekyFranky from Elegant, simple, what else can I say? Well, this not something that would make your sweetheart melt in your arms, but it warms my geeky heart... A simple piece, nicely done, fits its purpose and doesn't get it in your way.